As a student in the prestigious Richard J. Fox School of Business at Temple University, I have several interests. 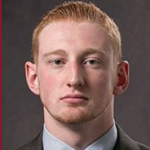 First off, I had the great privilege of playing football at a Division I program. Aside from what I do on the field, I love to golf, ski, hunt and fish. In my opinion, it is important in life to go out and enjoy nature in as many forms as you can. It is a great way to clear your head and approach problems from different points of view, especially when addressing difficult issues in a business setting. 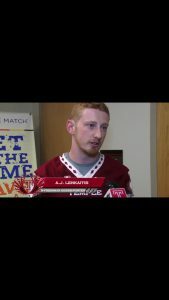 The photo above was taken during an interview after I participated in the Be The Match bone marrow drive and is accessible on the Temple Owls Twitter feed. I completely agree with what you said about it being important in life to go out and enjoy nature in as many forms as you can. So many individuals from our generation spend too much time in doors playing video games and watching television when they could be outside exploring nature. I also enjoy fishing up in the mountains. It is so relaxing and gives me a chance to reflect on life. Great page! I also agree that problem solving can be aided when using different approaches and thinking about things from different angles. Sometimes it is important to step away from work in order to clear our heads so that we can go back to it later on with full mental capacity.